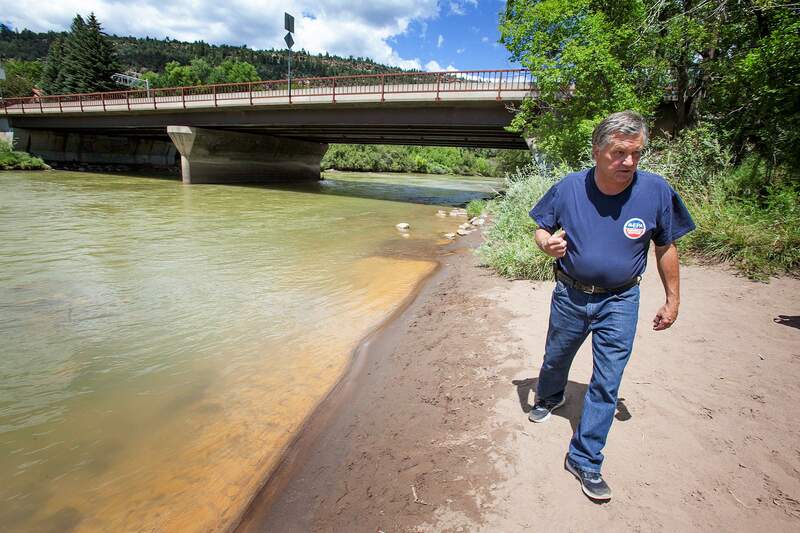 Peter Stevenson, on-scene coordinator for the EPA, walks next to the contaminated water of the Animas River at the 32nd Street bridge three years ago to observe water testing. A three-year study of water quality found no lasting impacts from the Gold King Mine spill in 2015. A three-year water-quality study found no lasting impacts from the Gold King Mine spill in 2015. San Juan Basin Public Health said the study started the day after the spill Aug. 5, 2015, in partnership with the Colorado Department of Public Health and Environment, the U.S. Geological Survey and San Juan County. The study looked at 200 river-water samples and almost 200 sediment samples, as well as more than 100 private wells from Durango to Silverton, testing for 13 different heavy metals and other possible contaminants, the health department said. Water quality, except in Cement Creek, is better than the minimum standards set to protect aquatic life and human uses.Additional sampling performed as part of this study revealed that natural variability in river flows produces occasional “spikes” in certain metals that may have been missed in less-frequent sampling.Sediment in the Animas River, including beach sediment at six popular Durango recreation sites, poses no risk to human health if common-sense precautions are followed.About one-quarter of Animas Valley drinking water wells had naturally-occurring bacteria present, and all wells should receive filtration or treatment.About 5 percent of Animas Valley wells had more serious contamination from heavy metals, nitrates or other forms of bacteria. Heavy metal contamination in these wells arises from the natural geology of the Animas Valley aquifer.The Gold King Mine spill was triggered when an Environmental Protection Agency crew dug too deep into the mine’s collapsed portal, ironically, for a cleanup project. The blowout sent 3 million gallons of mustard-yellow mine wastewater, laden with heavy metals, down the Animas and San Juan rivers, affecting three states and two Native American tribes. Though commonly called a “toxic’ spill, pH levels in the Animas River never actually reached levels that caused the heavy metals to become toxic. There were no reported aquatic life die-offs. “I’m not surprised they’re not finding any long-term impacts from the Gold King Ming spill. I never expected there would be,” said Peter Butler with the Animas River Stakeholders Group. By far, the biggest problem facing the Animas River headwaters is the constant heavy metals leeching into the watershed. The EPA declared a Superfund site about a year after the spill to address the issue. The EPA paid for the three-year water-quality study, which cost $460,000. EPA officials were unable to provide comment Friday about whether the agency plans to use the data, and if so, how. San Juan Basin Public Health said the study is the first in the state to use multiple real-time data sensors installed in a river. These sensors produced more than 10,000 data points a week on the health of the Animas River system, they said. Since the spill, these sensors have automatically triggered verification sampling of elevated readings on two occasions: during the collapse of an ice dam and a major storm event. “This study is the first of its kind to track these brief fluctuations in water quality to specific events and gives scientists and the community an improved understanding of how the Animas River system functions,” the health department said.